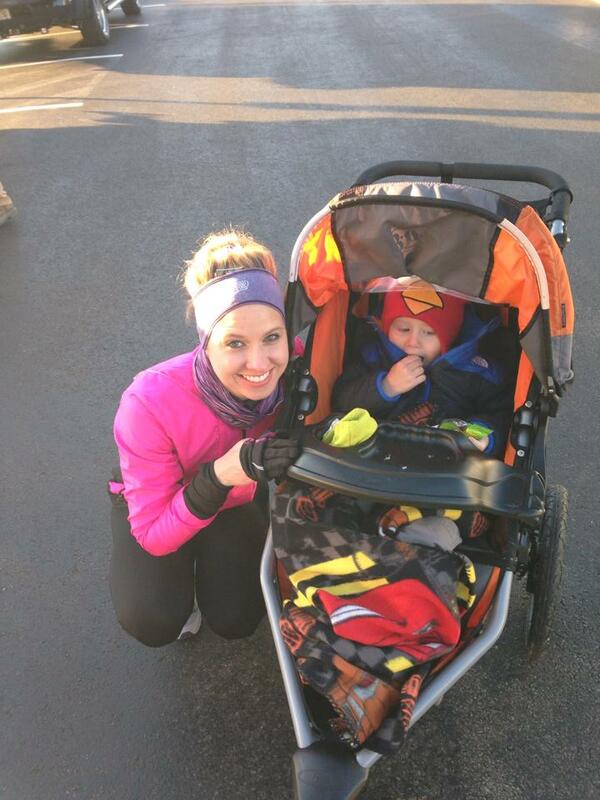 We were able to go for a run as a family together yesterday! It was so much fun! 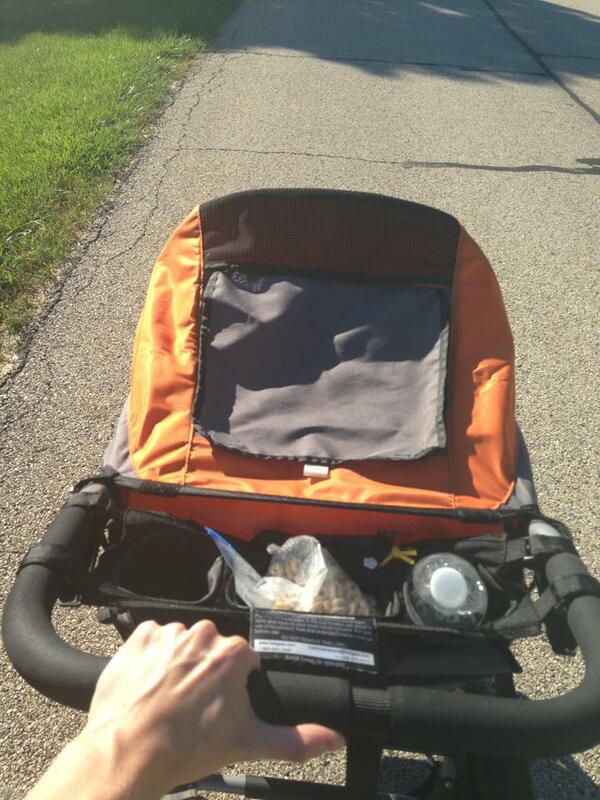 I am also in love with the stroller. It is amazing, perfect, and I wouldn’t change a thing about it. 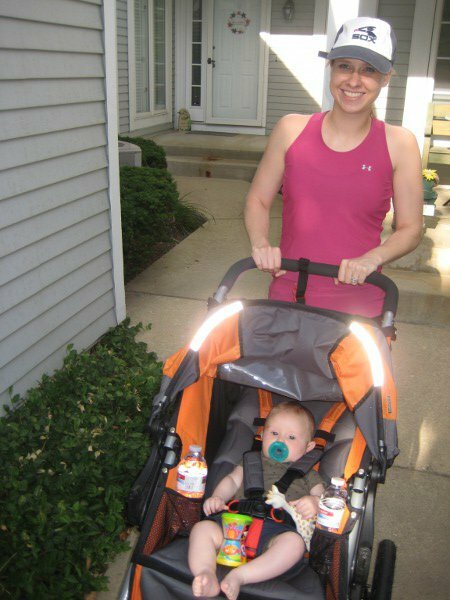 It is incredibly sturdy, which is what we wanted when it came to a jogging stroller. We wanted to make sure Jackson was as safe and comfortable as possible. I think we were successful! 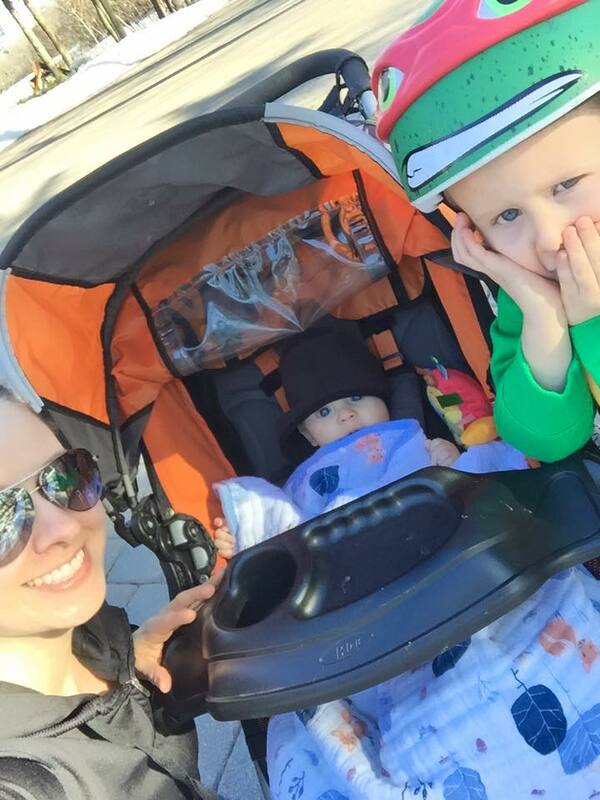 Although, you can tell who put him in the stroller. Notice the strap pads, how they are all uneven like he is drunk! Dada put him in there, not momma! I did not notice this until I was looking at the photos. But I will say, he looks rather comfortable in his new contraption. It is going to grow with him too, which is very important. It can hold up to 70lbs total. Just touching the shade umbrella thing feels sturdy. Jason kept going on and on how it felt like solid metal, which it is. 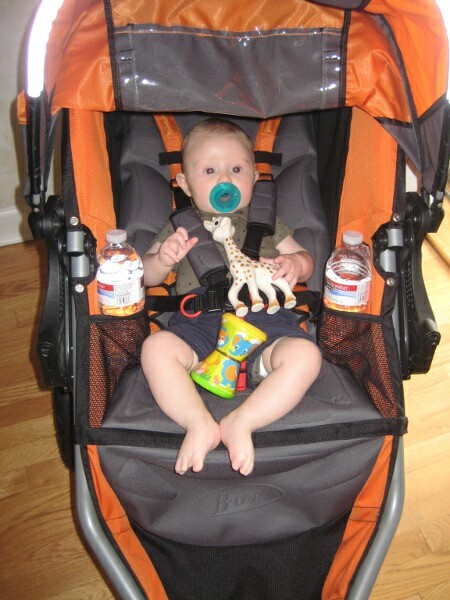 Our normal stroller is very nice and we love it, but you can tell that is just for walking and such. This is a safe big beast. Our run went very well. Jackson made some sounds at the beginning. When we weren’t moving fast enough. HA! I called him our little Jillian Michaels. Because when we started running at a steady pace he was happy as a little clam, enjoying the cooler evening air. We ran around the whole lake. Which I know is just over 3 miles or so. Jason forgot to lock his iPhone app and it didn’t record our distance and time. But I really didn’t care. I know about how far it is at this point. I wasn’t concerned with time at all. I was concerned with having a good time exercising as a family. Mission accomplished. Jason is all ready to go again tonight, but I won’t be around. I won a Mary Kay gift basket and pampering session and the session is tonight. My mom called me the lucky little entrepreneur. I keep bringing in income by winning things, the Medela shoot (which paid a good amount) and now this gift basket valued at about 100 dollars. Hey, I will take it. So tomorrow night we will go running again. I think this will be a nightly thing as often as our schedules allow. Overall, this was one of the best purchases we have made as a family. At least in my opinion. I am guessing Jason would pick the boat. Next year Jackson will get to use the boat much more than this year. I am looking forward to our run tomorrow evening. This is one of the most important things to me as a parent. Besides manners. (I have a clear vision of how well mannered I want him to be, hopefully I can manage to teach him this!) I really want to instill in Jackson how important fitness and healthy living are. I think this is a fantastic start. He is going to grow up always having an active lifestyle, it will just be something totally natural to him. I do not care what sport he picks to love, I just care that he gets up and gets moving. 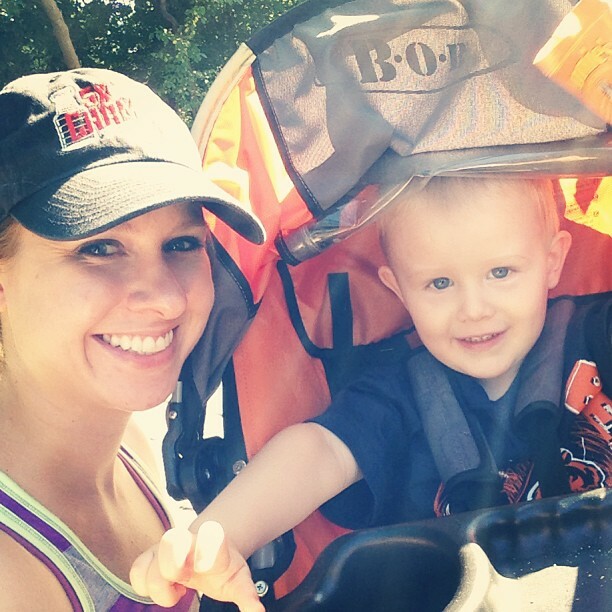 Even if he doesn’t want to do an organized sport but just likes to go on runs or bike rides, etc.